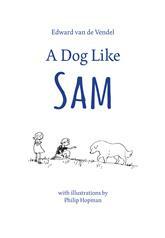 Last week my first book about the dog Sam came out in the United States. In Dutch it's called TOEN KWAM SAM and in the version that Eerdmans' Publishing House issued it's named A DOG LIKE SAM. It was beautifully translated by David Colmer, and of course the original illustrations by Philip Hopman are included. Next year also the second volume about the dog will be published! The book came out in Holland in 2011 and was awarded with the Zilveren Griffel (Silver Slate) one year later. Further editions are the French, the German, the Estonian and the South-African one, where it was published in all the official eleven languages of the country. Rights can be seen here, and the Dutch Literary Fund is giving out grants for the translation of this book (and others).